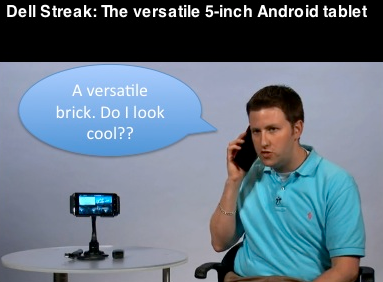 Today I bumped into a video showing the new Dell Streak, or as Dell calls it "the versatile 5-inch Android tablet". Some days, I find myself wondering if all these years of mobile device sales have not taught us anything. Look around you, look at the devices that sell well. They all make you look cool. Anything portable is a fashion item, something that walks with you, that tells everyone around you something about you. You are cool because you have an iPhone. Because you have an iPad. Because you have a Nexus One (kinda cool, with a vibe of geek). Or the Droid (and you wear all black). And so on. You can't tell me you would not laugh at a guy holding a 5-inch versatile Android tablet close to his ear. Even someone trying to do it with an iPad would make me laugh. probably hard. Who in the world would do it? This is the problem with versatile. You can do everything. Like a swiss knife. You have a 5 inch tablet and you can use it to chop vegetables (I saw Stephen Colbert do it with the iPad, it works). Or play ping pong. Or even make a call. Guess what? It does not make sense. The race for the perfect device is on. You have a full spectrum of sizes, from the dumbphone to the full tablet. Every size can have its perfect uses and eat some of the ones above and below. With a smartphone, you want to talk. You might want to watch a movie, but it is going to look better with a device slightly bigger. To read a book, you want a book-size device (not 5 inches, more). To listen to music, who cares, a pen would do it. If you have to type a large document, you better have a keyboard. To browse, something in the middle is ok, and maybe you can compromise and do it on a smartphone, in an emergency. And so on, and so on. However, just do not try to push it too hard. Versatile is just the wrong goal. Doing more with a device I do not even need is a bad idea. A tablet I can use to make calls? Why? Stick to Skype and video chats, do not give me a phone number on a device which is not made to call. In my space, Apple charges $99 per year for MobileMe. There is a lot of room to cut that price (and it works only for the iPhone, so good luck if someone in the family has a different device). At the other end of the spectrum, Google charges zero for Google Sync (albeit it is quite a bad product, sometimes free can be of a depressing quality...). How do you move between these two extremes if you are a carrier? Per-month, per-year, free, advertising or freemium? I say, for now, stick to per-user per-month on the high end of the market, and check freemium for the masses (they are coming). In the last five months, the market has moved superfast. No surprise here: mobile is the hottest thing around and sync is the killer app when it comes to connected devices. Everyone jumped into this market, from MOTOBLUR to Nokia Ovi to Microsoft My Phone. Lots of activity, lots of opportunities. Google itself has been pushing its cloud even more. They made it a bit too tightly coupled with Android, in my opinion, but I can understand why they are going that way. They are going for an open platform with open source, but tightly coupled with a cloud service. In a way, it is an horizontal-vertical play, if there is such a thing. Go horizontal and open source on the device (a step forward from the Microsoft model), but vertical on the cloud integration (a step forward from the Apple model). It seems to work. You have a lively community of developers, but most of the Android phones come pre-bundled with the Google cloud services. You get your address book, your calendar, your pictures automagically synced on the Google cloud. It is sticky. It is easy to use (so much that it is transparent). And it is freemium (2GB of storage are free, then you start to pay). What not to love? What about Apple? Well, they chose a different route. They chose to charge you $99 per year for the MobileMe service. I hear it is going reasonably well, but nothing to be bragging about (in fact, they never brag about it on stage, and that is a sign for things that do not work too well at Apple). They had technical issues at the beginning, but I do not think that is the problem. The issue is the $99/year. People want sync, they want to backup their data to get them back in case they lose their phone, but they are not going to pay for it right away (I still believe you can charge upfront in the enterprise, but consumers are only for freemium today). Same for picture sync (Flickr) or networking (LinkedIn) or many other freemium models. Get them hooked and they will pay, eventually. They will recognize the value. Maybe not 100%, but a good percentage. Enough to justify a business model. Apple missed the mark (to use a Facebook term ;-) They were greedy and thought they could make money right away. They are probably not making enough. And they are not making their service sticky enough. While Google is attacking them and eating in their plate, with a freemium cloud service strategy (which, eventually, might even be only supported by ads). Since I am good at predicting what Apple announces at its conference (am I? ), I have one for you: Apple will make MobileMe freemium at WWDC on June 7th. They will have a free service for everyone, and a premium service for those that want to pay for more storage or more features (such as Find my iPhone). One thing though was not clear: the future of Chrome OS and Android. How they will co-exist, how they will work together, how they will eventually merge (if they will). The Google people had no convincing answers. None. You hear about how Android is going to dominate mobile, then they show you an Android tablet and you think "iPad killer", then it comes an Android Google TV and you think "my TV does not move, Android is not just an OS for mobile!". 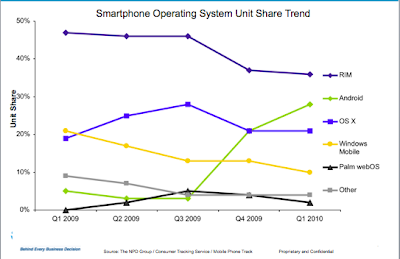 Quick leap of faith to a world where mobile takes over the desktop (e.g. the desktop becomes a non-mobile mobile device, like your TV) and you could easily conclude: Android is the OS that could dominate our future, the OS for our new world of connected devices. If you go back to the history of Android - as far as I know - the original idea was exactly that: to build an OS for connected devices. Smartphones came later, as an implementation of the idea. Android is just fulfilling its original destiny. It is open as in open source, it has a commercial entity behind (a rather big one...) and an ecosystem of developers (very excited ones, since they get a phone at every Google conference). It seems a done deal. Then they start talking about Chrome OS. The OS for the web. The OS in a browser. BTW, the same browser we have in Android. But now it has a separate marketplace, called Web Store for Apps. Not the Android apps, the other ones, the web apps, the one that also run on Android. Because it has a browser. And it is just for netbooks (a dead category) and tablets (where we also have an Android version). The conundrum is clear: Chrome OS brings the web to your device. It is the ultimate platform to expand the current Google business model. If everything becomes a browser, including your TV, Google has 90% of the advertising in the world. Chrome OS is the chosen one. 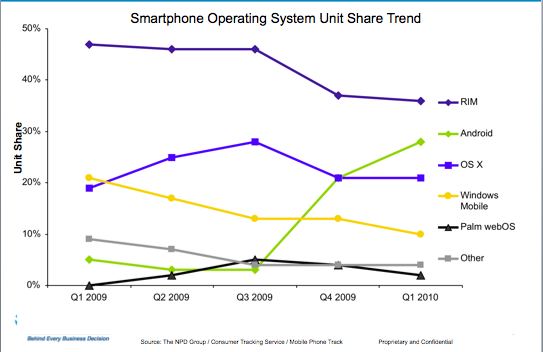 Unfortunately, Android is taking off like a rocket... It is a platform where their current advertising model does not work very well. It does in Google Maps. And maybe in Search (maybe). But the apps have a completely different ad model. The in-app advertising is a new science, one that nobody has mastered yet. Maybe AdMob, if they ever manage to close the acquisition (I am starting to have serious doubts it will happen, sadly for Omar and his team It closed today!). In any case, it is a new market altogether, one that Apple is attacking full-force with iAds. One where transactional advertising is likely to be less important than branding (and Google has zero branding advertising business). Chrome OS fits perfectly with the Google business model. Android does not. But it is winning, and you can't stop something that is winning. At the same time, you can't easily make a choice of killing the chosen one. So you keep them both and wait until one dies (hoping it is Android). When Android wins, you scramble to adapt your business model and kill the other one in a graceful way: "Chrome OS merges in Android, the Web Store for Apps becomes part of the Android Marketplace" and so on. I take bets on this one. There is one thing humans are good at: pattern analysis on a blink (a-la-Gladwell). Looking at one company after seeing 1,000 gives you some ideas on how that particular one would develop (that is the common VC argument). History repeats itself, after all. It is not rocket science, but it has been empirically proven. If you do proper pattern analysis, you get it right most of the times (works with the stock market too). One quick look at the following picture and a pattern develops in front of my eyes. The picture says that Android now sells in the US better than the iPhone. I have a hard time believing it by looking around me, but NPD has been quite reliable in the past, so we have to assume they are right. Quick look at the mobile market today: there is an Apple operating system which is closed and no device manufacturer can put its hand on (it is only shipped by Apple). There is another operating system that is available to any device manufacturer who wants it (at low cost), and it can be put on a small, medium, large device (in fact, any connected device would do it). Any pattern recognition? I bet. That's the PC business. One Apple operating system which was closed, and one Microsoft operating system that hardware manufacturer could adopt and ship at "low" cost (for the time). Apple was better and now they have 4% of the PC OS market share. I feel history might be repeating itself. The major difference is that now the operating system must be open source (or you are out), and be zero in the BOM (sorry Microsoft), and that the amount of devices is actually ample. Actually, the race to connected devices might be the key here. Apple can chase Android on smartphones or pads, but Android is getting on millions of "other" devices (set-top-boxes, home appliances, cars, and so on). Devices Apple does not care about. Devices which will run in the billions in a few years: they will give Android an enormous installed base, which could lead to a lock-in. Lock-in... I think I have seen that before too. As you might remember, I am a big fan of Palm. One thing you might not know, is that I am a big fan of HP as well. I spent time at the HP Labs as an invited scientist in 1995, and the HP Way always stuck with me. Therefore, you might understand my happiness when I heard about HP buying Palm. I was quite worried about the future of Palm, and now they have someone with deep pockets behind them. They are not going away. They are staying and have a great chance to succeed. Where is the big value of Palm? Easy, it is WebOS, with its tight cloud service connection (Synergy and the continuous sync in the background). The best implementation of an OS I have seen around. Better than iPhone and Android, in my personal opinion. Just a tad slow on the Palm hardware, but that is easy to fix for HP. My suggestion on WebOS is easy: open source it. Fast. If there is one thing I believe Palm did wrong, it was following the Apple model. Keep it closed and you die, unless you are ahead of everyone and big. Palm is none of the above. Look at what is happening in the browser world. Internet Explorer market share is collapsing. Firefox and Chrome are catching up extremely fast. Give it a couple of years, and the open source browser will dominate. On mobile, it is even more important. Developers count. They are everything for a platform. As you cannot sell a mobile phone without cloud services today, you cannot be successful without developers. What drives sales are applications. And they are built by developers. And developers pick platforms that are open source (unless you are ahead of everyone and big, such as Apple). Symbian got it. Nokia got it. Intel got it. Google got it. Apple does not have to do it (unless someone catches up badly with them, but I do not see it happening that soon), Microsoft should but they do not get it (guys, believe me, the operating system market does not tolerate a closed OS you have to pay for, you will have to get it one day). HP must. If they get it, WebOS might become a force in the market. I expect HP to put it on netbooks, and a lot of connected devices. Make it open source and you get a winner. Keep it closed and you have yet another missed opportunity. We are in the middle of a lot of debates these days: is Apple the new Microsoft? Is Microsoft following Apple with Windows Mobile 7? Should HP open source WebOS (more on another post, my answer is yes)? Is Google Android open or closed? I have been bashing Apple for months (years?) because of the lack of Calendar API on the iPhone. It was a very large visible sign of closeness on their part. A lot of apps need to create an event on the calendar (thing anything medical, where you need a reminder) and the lack of API access was hard to comprehend. I was quite happy we finally had a chance to build the calendar sync on the iPhone and iPad, when I received a note from one of our developers. The email explained we had problems building calendar sync for Android. They added that the reason was that there is no public calendar API on Android. Whaaat? No calendar API on Android?? Are you kidding me???? Unfortunately, developers do not lie, so it is true (had I heard it from a marketing person, it would have been quite different ;-) There is no public calendar API on Android. Unbelievable. Wait, but Android is open source, right? You could download the calendar client, compile it, put it on the emulator (which does not ship with it), add the data provider and you would be good to go. No need for public APIs when you have access to the source code. You can do all that, and it works pretty well when you just read the calendar. However, as soon as you try to write to it, creating a new calendar, Google gets upset. At the next sync with Google Calendar on the cloud, any calendar that is not on the Google servers gets wiped out on the device. Not nice. Not nice. Any other option? Yes, one is to create a calendar in Google and write to it on the device, ultimately doing double sync (one in Google Calendar, one in your Funambol server). It is like double dipping, though, and the likely effect is spreading duplicates instead of germs. Bad idea (but we are going to explore it).